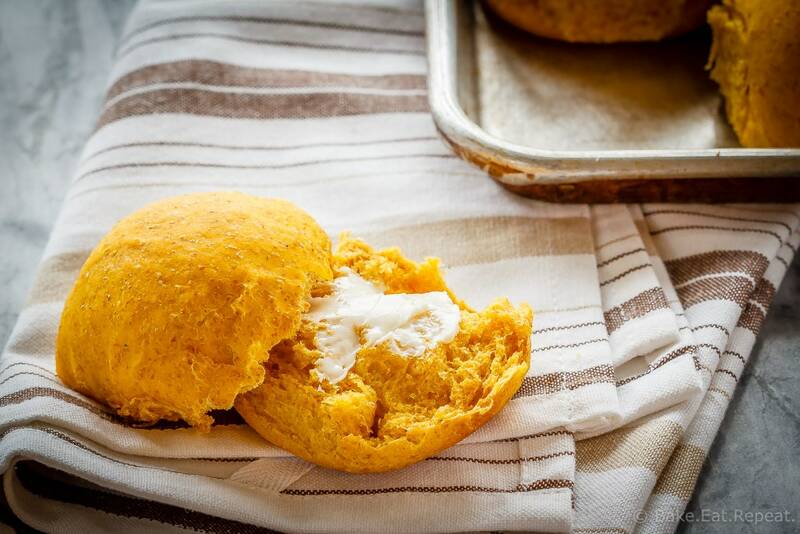 These whole wheat pumpkin dinner rolls are soft and fluffy and so easy to make. Plus they are amazing piled with turkey or ham for lunch! 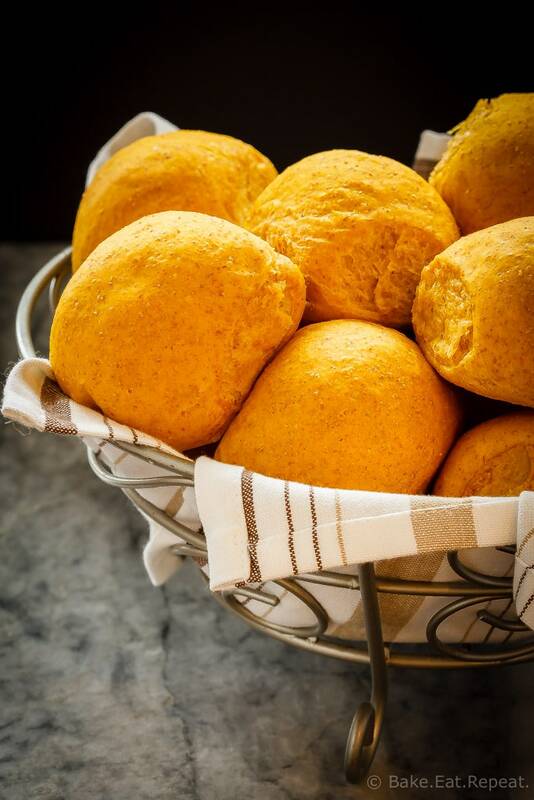 Do you like making homemade bread and dinner rolls? I really do, but I’ll admit that I definitely go through phases where I make all of our bread, and then other times where I won’t make it at all. My kids actually get all complain-y when that happens. Questions of “when are you going to make bread again, mom?” start to be heard every time I pick up more bread at the store. Spoiled kids. They’re right though – homemade bread and rolls are so much better then the store bought kind. And they’re not that hard to make – pretty easy, actually. It’s just a matter of taking the time to do it. There’s not all that much hands on time involved, but you do need to do a little planning when you make bread so you’re home and able to do the next step when the rising times are finished. 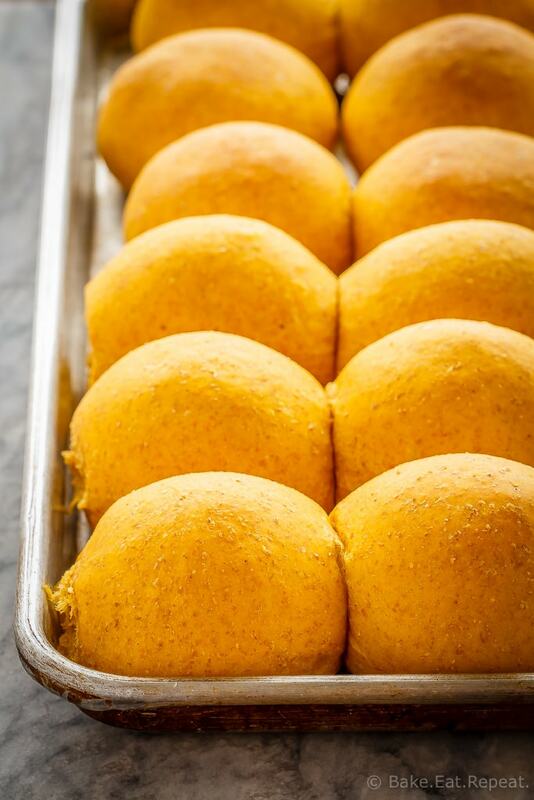 My problem is that I often think of making bread or dinner rolls at times when I need to be out of the house at the same time I would need to be shaping the dough – so then I don’t make it at all. Clearly I need to be better at the planning stage of things around here. At any rate – when I do make bread at home, we are all very happy about it. These whole wheat pumpkin dinner rolls are one of my favourites. They’re super soft dinner rolls, even with half whole wheat flour in them. The pumpkin keeps them soft and they don’t seem as dense as a lot of other whole wheat dinner rolls are. Soft and fluffy and easy to make, they are the perfect accompaniment to your holiday dinner table. Or anytime really – if you’re like me, and happily use pumpkin all year round! 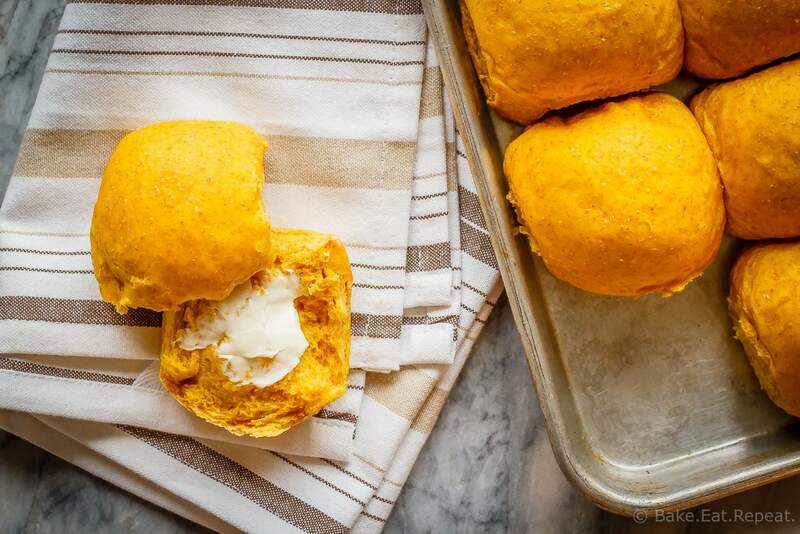 I’ve also shared this Pumpkin Dinner Rolls recipe over on Food Fanatic. I haven't tried anything else in these, but honey should be a good substitute, or even granulated sugar if you want, although I think honey would be better. How would you go about freezing these for later? Hi Sharon, I just put them in a plastic bag to freeze after baking. I have bread bags that I found at a specialty store which are a great size for it, but zip locks work well too, you just can't fit as many in them. Just make sure whatever bag you use is sealed. Then take them out about 3 hours before you want them and let them defrost at room temperature. You can also defrost them in the microwave, but they may dry out a bit. Or if you're a little short on time, defrost them at least partially at room temp or in the microwave, then wrap in tin foil and place in a 350 degree oven for 10 minutes and they'll taste fresh baked. Thanks for stopping by!